People needing transportation to in-county medical appointments are encouraged to contact the Otsego County Bus System (OCBS) at (989) 732-6224, ext. 1. Each bus and van has a lift for people unable to walk up the stairs of the buses or step into the vans. Drivers are trained to safely assist riders in and out of their vehicles. If necessary, caregivers (one per rider) may accompany patients going to and from medical appointments (at no charge to the caregiver). The cost for older adults (age 60 and older) and persons living with disabilities is currently $2.00 for a one-way trip. Financial assistance for OCBS bus fare is available to those who qualify through the OCCOA. Please contact OCCOA Medical Transport Intake Specialist Theresa Ross at the OCCOA at (989) 748-4084 on Tuesdays, between 7:45 a.m. and 2:45 p.m. to find out if you qualify. RSVP Volunteers are available to drive qualifying Otsego County residents to out-of-county medical appointments. OCCOA’s Volunteer Medical Transportation Program offers free rides to Otsego County older adults for out-of-county medical appointments within the state of Michigan, as well as some in-county medical appointments (including, but not limited to doctors, labs, dentists, eye care practitioners, and pharmacies). Volunteer ride requests are arranged through OCCOA Transportation Scheduler Theresa Ross and provided by RSVP volunteers. Ross should be contacted (at least two weeks before the dates needed) at the OCCOA at (989) 748-4084 on Tuesdays (between 7:45 a.m. and 2:45 p.m.). 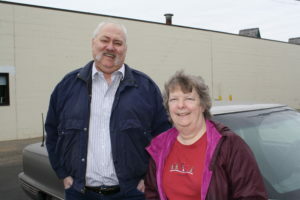 Rides are subject to client qualification and availability of volunteer drivers. Who qualifies for volunteer drivers? This assistance is targeted toward Otsego County residents who are 60 years of age or older. If you are an Otsego County resident under age 60 you may qualify, if no other options are available to you. To which locations are rides available? RSVP has volunteers willing to drive to such out-of-county locations as Grayling, Alpena, Petoskey, Traverse City, Grand Rapids, Midland/Saginaw/Bay City area, Ann Arbor, and Detroit. Volunteer assistance is limited on an in-county basis to those who are unable to ride in county buses or tax other public transportation such as a taxi service. How do I schedule a volunteer driver? Please call the OCCOA Medical Transportation Program Scheduler Theresa Ross at (989) 748-4084 on Tuesdays (at least two weeks before each appointment) between 7:45 a.m. and 2:45 p.m. to request a volunteer driver. How soon do I need to call to schedule a ride? You will need to plan on contacting the OCCOA at least two weeks before your appointment as noted in the previous question. Are the rides provided by volunteer drivers guaranteed? Because the program is volunteer-based, the OCCOA cannot guarantee that an RSVP driver will be available when one is needed. However, approximately 80% of requests are filled. The sooner a request is submitted, the more likely a driver will be found. What information will I need to provide when submitting a request? Expected length of your appointment(s) – Please ask your doctor’s office to estimate this for you. They have you blocked out for a set amount of time and will know this. You will need to be able to get in and out of the volunteer’s vehicle with limited assistance. If you need to be lifted in and out of the volunteer’s vehicle, please arrange for a family member or friend to help you. You will need to arrange for similar assistance at the facility to which you are traveling. May a family member or friend come with me? If a family member or friend is not able to drive you to your appointment but would still like to come with you, they are welcome to come, too. When submitting your ride request, please let the scheduler know that you would like to bring someone with you. Will I still be able to get a ride if the weather is bad? Sometimes winter driving conditions are so poor that rides need to be cancelled. It is important that both you and the volunteer driver are safe driving to your appointment. If driving conditions are poor, you or the driver may elect to cancel your ride. If the driver doesn’t feel safe on the road, he or she will contact you. If you feel unsafe, please contact the OCCOA. If the agency is closed due to poor weather conditions, programs will be cancelled for that day, including the Medical Transportation Program. If this occurs, you will be contacted by your scheduler and encouraged to contact your doctor to reschedule your appointment. If you do reschedule, you will need to contact OCCOA on the scheduling day to submit your request for another driver. Please be sure to call with this information two weeks before your appointment. How will I be notified that a volunteer driver has been found? You will be contacted by your scheduler when a driver has been scheduled. You will also be contacted by the volunteer driver sometime before your appointment. Please contact your scheduler as soon as possible to let her know. She will notify the volunteer driver. Is there a charge for my volunteer driver? Pleaes be sure to write in “Medical Transportation Program Donation” on the memo line on your check. © 2018 Otsego County Commission on Aging. All rights reserved.